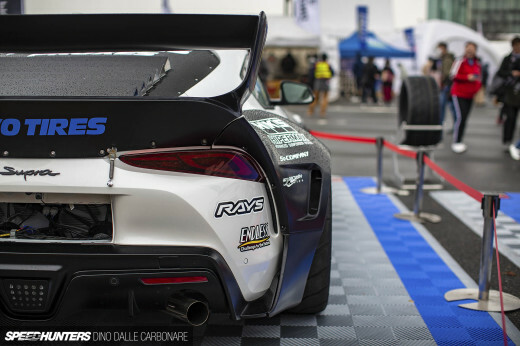 Immersed in an environment awash with canards, splitters, diffusers and multi-element wings, standing out from the crowd at the 2015 Yokohama World Time Attack Challenge bordered on the impossible. This is a world where grip is king, innovation breeds performance and as such the limelight naturally gravitates towards the competitors bristling with wild new ideas or displaying dizzying levels of aero insanity. But strolling pit lane in search of spotlight features, the familiar jellybean silhouette of Toyota’s flagship performance offering of the 1990s caught my eye. In contrast to the hordes of outrageous and extroverted machinery, this JZA80 Supra appeared suspiciously restrained; an exercise in retaining an appearance relatable to a road car. 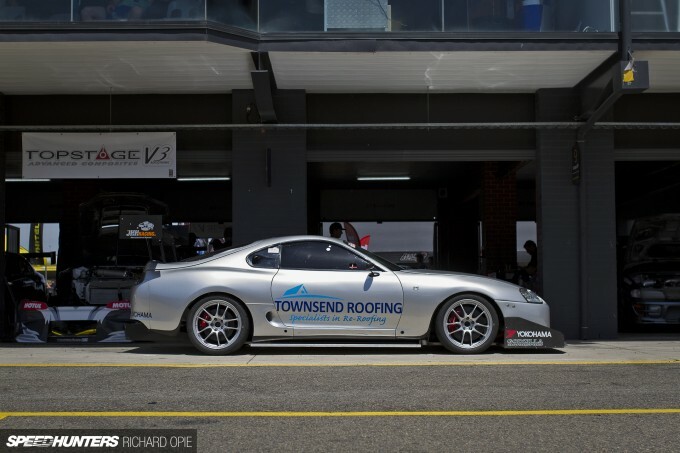 In fact, the Supra looked like it could conceivably still be a road-legal car, right down to owner Nathan Townsend’s government-issue registration tag on the passenger side of the windscreen. 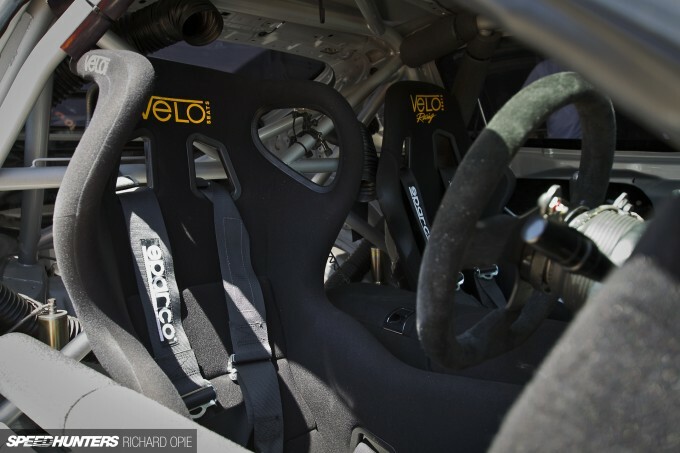 In typically welcoming WTAC form, Nathan was kind enough to talk me through the car, first explaining the Supra’s primary use revolves around circuit racing and hillclimbs at a club motorsport level. That explains the comprehensive rollcage featuring hefty side intrusion protection, consistent with builds employed in door-to-door combat. 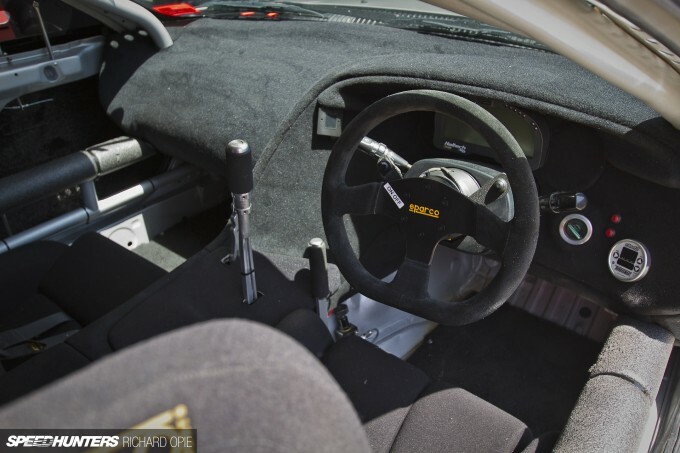 A well-prepared interior to my mind is always indicative of a thorough build, and from within the hatch opening it’s evident the Supra falls into that category. From the NACA-ducted driver ventilation, to the 4kg Lifeline fire suppression system and even the transparent firewall (in the foreground of the shot) separating the cabin from the boot mounted fuel system and dry sump tank, no corners have been cut. Despite its portly exterior proportions, the JZA80 isn’t a car well known for its vast interior dimensions. Nevertheless, among the jungle gym, Nathan hunkers into a deep Velo bucket seat, with a simpler item reserved for passenger use. A pair of Sparco 6-point harnesses ensure safety is a priority, and if you look closely past the seat backs on either side the rearmost units of the onboard air-jack system are visible. The cockpit-style dash synonymous with the JZA80 echoes the exterior in its simplicity. Although now a mere gutted shell of its production-self, the dash and console houses the essentials and nothing more; a Racepak GPS/data logging dash unit, Turbosmart eBoost 2 boost controller, Sparco wheel and the shifter for the TTI 6-speed sequential gearbox contributing to a purely driver-focused space within the Supra’s glasshouse. It’s always tough to resist making calls like ‘this will decimate all’ whenever a bonnet’s popped and Toyota’s boosted halo engine is presented in all its straight-six glory, but I kept corny quotes in check as it quickly became apparent the high build standard was retained between the front struts. With a stock crank at its core, the JHH Engineering prepped lump encompasses a set of Manley rods with JE forged pistons, all kept lubricated via a 5-stage dry sump setup to ensure oil surge fears are a thing of the past. Cylinder head wise, JHH tickled the ports and fitted 1.0mm oversized valves, opened and closed by a pair of Crower Stage 3 cams. 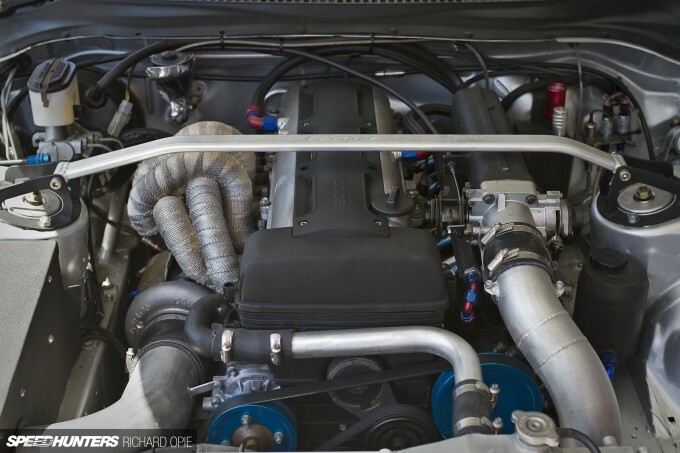 Mounted low on a custom-built steam-pipe manifold is a Garrett GT35R turbocharger, which in pushing 25psi into the 2JZ translates to a reliable 650hp at the rear wheels. Enkei PF01 wheels measuring 18×10 inches at each corner conceal Brembo brakes all round; giant 6-pot calipers coupled with 330mm DBA rotors at the pointy end with slightly more modest 4-pot variants offering stopping power at the rear. High-end MCA Gold Series coilovers with remote reservoirs assure precise, tuneable suspension control. Given the somewhat more restrained style of the Supra’s aero, it’s forgivable to think the car doesn’t quite appear quite as intense as Nathan’s Pro Am class peers do. 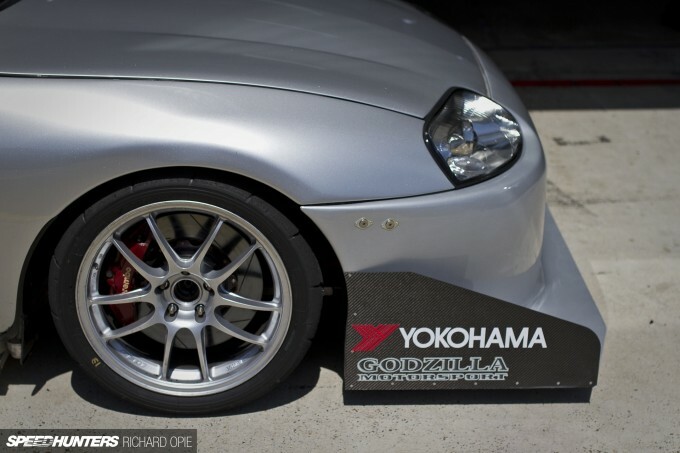 While more consistent with an Open class look, the Supra’s custom front bar with carbon end plates is connected to the large rear diffuser via a flat floor, meaning that the car is eligible for the Pro Am segment of the WTAC competition. Nonetheless, complemented by that huge carbon rear wing, the JZA80 demands real presence on track, assisted of course by the distinctive 2JZ-GTE growl. Finishing the weekend with a best lap time of 1:39.01 around the Sydney Motorsport Park circuit, the time attack bug has evidently affected Nathan. A solid result for a first foray onto the track for the Supra, there’s absolutely more in the pipeline for the cult-classic Toyota with further development promised. 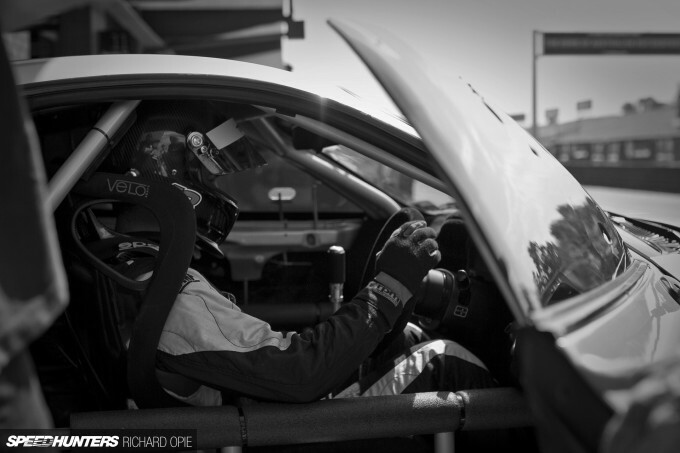 Far from its past life of “an Auto Salon type car with three 15-inch subwoofers and shiny bling everywhere,” as Nathan put it, I have a feeling this isn’t the last we’ll see of one of the most immaculately prepared entrants in this year’s WTAC pit lane. Its definitely a good build, and I appreciate that, but don't you think that there are way too many Supra's out there in the tuning world? It's not that I hate the car, it's just that it's the import car F&F fans love, so it's super-popular. GoKarting 101 I cant say i notice it myself and i own a Supra. Oh yes, now this is what I'm talking about! Very beautiful and elegant i a way! 650 RWHP from a GT35R is alot :O!!! I presume this is with oxynated race fuel. PartBoxDotCom GoKarting 101 Depends on what part of the world you're from I guess. Pretty rare to see in New Zealand and Japan, but in my other home of Sweden, they're almost the most common car at events like Gatebil! Townsend roofing? Wasn't expecting that on the side of a supra, with the purchase of a roof comes free supra tuning....winter special. GoKarting 101 Yes I can understand why you'd want to distance yourself from those awful "import car F&F fans" - is this a solid, verifiable demographic, or a lazy and vague generalisation that you have used to justify your thoughtless prejudice against those that might otherwise just be fellow car enthusiasts? As a Supra owner myself I would say the complete opposite. Most of the events I go to I'm lucky if there is even one other Supra there. Maybe in the USA they are more common but in New Zealand, Australia, UK & Japan it is pretty uncommon to see a nicely built Supra on the streets. DavidFRogers Slappy_Pistons Well, everything is relative. I wouldn't call JZA80s rare by a long way. It's ugly... But as long as it is fast, I wouldn't care even if the car looks like a toilet lol. I love to see the turbo somewhat low mounted, it just screams time attack. This was a cool car to witness and see at time attack, the 2j at full roar sounded great and it looked super clean. I really hope this car gets some huge upgrades and becomes a weapon in its class, the supra is a dying breed in time attack racing and I'd love to see one at the pointy end of one of the classes. You know what would actually be awesome to see, a 3sgte swapped supra like the old gt500 castrol supra, that would be sweet. 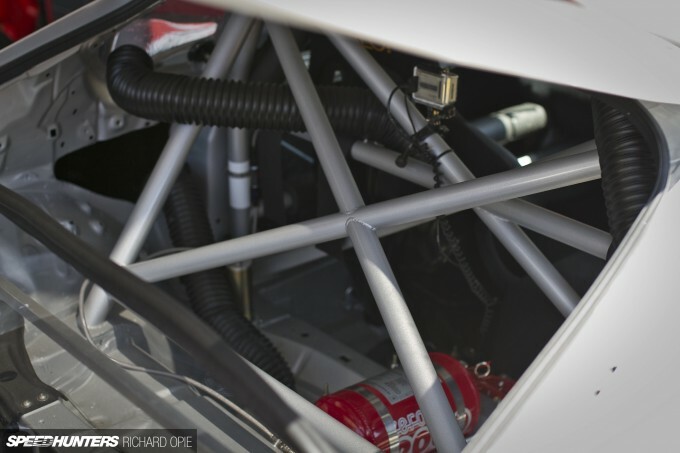 I find the front bar canards confusing, is that just an air pocket? Seems like it would cause a lot of drag compared to down-force? 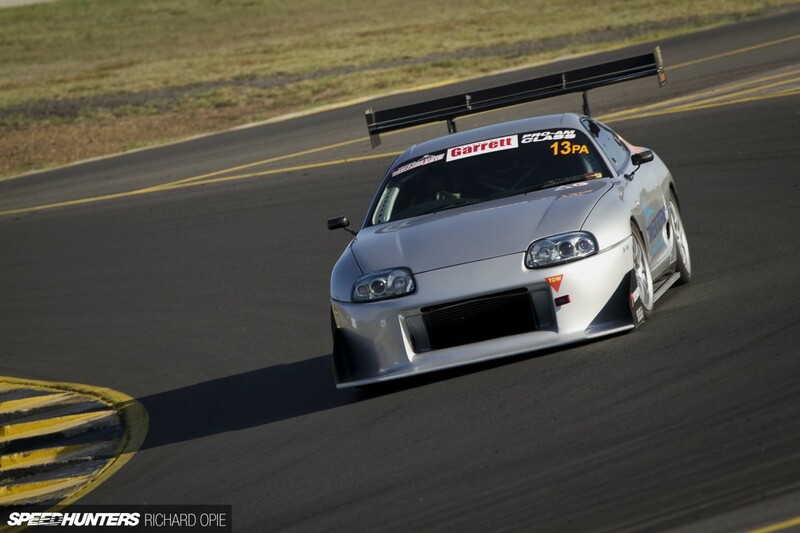 If you were really into time attack racing you would know that the supra chassi is actually extremely rare in time attack racing, you won't find many competing at all. So in terms of what this guys is doing with his car it's extremely rare.. Also come on dude, how many supra so do you see with purposeful exterior upgrades to aid aerodynamics, or tastefully sized wheels to enhance performance? This is a rare car any way you look at it. Do you have a before picture from the bling days? Gary89 The engine bay arrangement is top notch I think, I like the low-mount also... it surely makes sense from a heat management perspective too perhaps? GregoryS I thought so - and the JZA80 shape has aged very well! GoKarting 101 I don't get to see too many of them back home - and even less in a Time Attack situation (even though there were two present at WTAC this year). But if there's too many in your part of the globe, maybe it's testament to an enduring and successful platform! Hmm never thought of it that way but perhaps the lower turbo mounting could aid in heat management. Turbos can be pretty heavy though, so the lower the better to reduce the centre of gravity. Both right, lower weight, shorter and less bends in runners, straighter dump pipe, less heat against fire wall and brake booster. SnoozinRichy GregoryS Yup. Some cars will never age. Take for example the Ferrari Enzo (produced in 2002) or some others, not so expensive. Gary89 There's a very fast one competing in Sweden, won the PRO-class overall this year. Townsend48 i23sonny That is definitely a draggy solution to produce front df. Pretty common in Pikes Peak though as drag isn't such a big deal there, especially with a lot of power. One thing that makes the Peugeot's front end different from this is the radiator ducting trough the bonnet which makes it a lot more efficient. But anyway aerodynamics are always a compromise and with a rear wing that big all the front df possible is needed. Also the front of course affects the rear and for example winglets or dive planes in the front can reduce the df produced by the rear wing. Ran out of time to make the ducting for the bonnet good spotting that's next on job list. And yes any down force unfortunately ends up with drag. FAYSERN TristanWilliams exactly, it's a context thing. But I had a laugh at the meme! i imagine its not going to stay looking...'subtle' for long is it? !